3D printing or additive manufacturing has been around for decades. But it hasn’t been until the last five years that the hype has exceeded the reality of what this technology can do. After reading many articles from industry insiders, we've collected some key takeaways on the current and future trends for this manufacturing technique. Complex shapes – Many 3D printers can replicate fairly complex geometries and shapes. This ability has opened a whole new world of possibilities in the medical field. Today, many universities and researchers are experimenting with creating artificial limbs and organs using this technology. Companies like Organovo, are using 3D to bio-print tissue to be used in research applications. Universities are working on organ replacement trials. One research lab created titanium jawbone implant using 3D. Prototyping – Although 3D has been used in this capacity for a long time, today there is a more robust platform to produce prototypes in various materials and with greater precision. Higher end printers are also capable of low-volume part manufacturing. Availability – From a consumer standpoint, 3D printing is becoming more accessible. In fact, Staples Office Supply recently announced that they would be adding 3D printers to many of their locations. 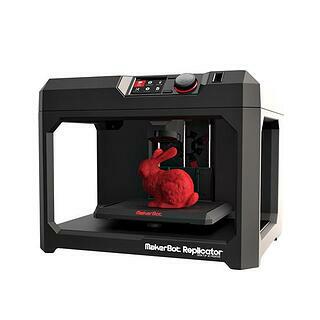 Cubify and Makerbot have created at-home versions of these printers as well. Software – Advances in CAD software and 3D imaging have helped uncomplicated the design process. Don’t get me wrong, it still isn’t easy to design from scratch, but the applications are becoming more intuitive. A few companies are offering libraries of files that can be used to create objects of all kinds. File sharing sites like Thingiverse, created by Makerbot, one of leading edge companies that developed desktop 3D printers and scanners, encourages designers to upload and share their files. Even the government has joined the fun with a website called NIH 3D Print Exchange where you can find, share and create 3D files that relate to biology and the human body. Technical limitations – Carl Bass, the president and chief executive officer of Autodesk, Inc., a maker of professional 3D design software and consumer applications, said in a recent article, “Just as the microwave didn’t replace all other forms of cooking as initially predicted, 3D printing will not replace other manufacturing technologies, let alone industrial-scale ones. It will complement them.” The current technology is not fast enough to replace high-speed manufacturing processes, and it lack flexibility in material use. The software and design tools needed to create a 3D file are still far too complex for an average user. You must know design and engineering to build a CAD file that will translate into a usable prototype or part. The technology has not yet advanced to create articulated prototypes. Each component must be separately printed and assembled. In addition, the creation of these parts can take some time. According to one expert, it can take several hours up to a few days to complete the process. Cost – Like another fad, the bread machine, once people figured out it cost a great deal more to make bread from a mix in their machine not to mention the time, the appliance went into storage. 3D printers are not cost effective in most manufacturing situations. The materials can be expensive, so producing a large part can raise the cost exponentially. Industry insider and founder of 3DPrintUK Nick Allen describes it this way “Cost is based on the material used, so big things are expensive and small things are cheap. So producing anything in bulk that is bigger than your fist seems to be a waste of time”. Materials – The materials used in the 3D process are still very limited. It has expanded to include metals and ceramics, but, for the most part, plastics are the material most commonly used. Most machines cannot currently overmold or print two materials like plastic and metal together. Stratasys does sell a dual material printer, but the two materials are both polymer based. This printer is particularly useful in complex prototype applications. Speed – If you have ever attended a trade show featuring one of these printers, they draw a crowd. And you can return two hours later to see the same part still processing. The speed (or lack of speed) is just a function of the way 3D printing works. In this process, layers of material are gradually added to create the part. The larger and more complex the part, the longer the process takes. There are companies that are working on this problem, but it will generally apply to industrial applications. Strength and finish – The layers of material create stratification. When you have stratification, you also have a part that doesn’t have the strength of a solid molded piece. This process also creates a surface finish that is rough and must go through additional processing to obtain the desired feel.